Mandriva Announces Pulse 2 v1.2 - A technology for Linux and Windows desktop roll-out projects. Mandriva announced the immediate availability of version 1.2 of their Pulse 2, an Open Source tool for managing workstations, mobile computers and servers. Mandriva Pulse 2's purpose is to make managing of information systems much easier for those who choose to use it. 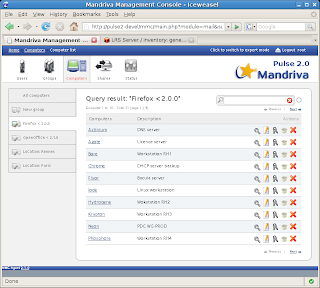 Mandriva Pulse 2 keeps a software and hardware inventory for each computer in its database, deploying and updating applications. Other features include diagnostic and remote control modules. This set of tools automates the management of workstations, servers or even mobile computers and, at the same time, reduces management and information system administration costs, regardless of the operating system. Pulse 2 identifies instability risks and security errors in time to prevent further problems, and it is able to detect differences between current features and security policies that are pre-established. "Companies are called upon to manage information systems ever more heterogenous whilst at the same time assuring their global availability. [...] The status of Open Source software gives Pulse 2 a powerful capacity of integration within highly diversified environments. It helps users to manage this diversity by enabling updates and maintenance tasks no matter the number of platforms and their location, to reduce the time and cost of the system administration. ", stated Mandriva's Business Products and Services Division VP, Sebastien Lefebvre, in the official release announcement. Mandriva Pulse 2 increases the overall security and reliability of user environments by automating roll-outs, maintenance and update processes. It can also observe and record user's choices, making migration a faster process. Having a modular architecture and bandwidth management mechanisms, Mandriva Pulse 2 is a great solution for large, wide-spread IT infrastructures. Mandriva is the publisher of one of the most popular Linux distributions, Mandriva Linux, a user-friendly operating system. Mandriva's products are available online in 80 languages, with dedicated servers in 140 countries. More information can be found by accessing their website.